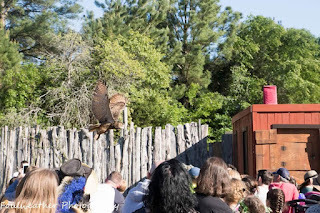 Over the weekend, a buddy and I headed over to the Sherwood Forest Renaissance Faire in McDade. Located within Bastrop County, the natural beauty of Elgin's wooded areas perfectly evokes feelings of an older time. Now in its 7th year, the fair has quickly grown to become one of the largest events of its type in the state of Texas, touting over 40 stage acts and 130 vendors. Of course, with so much to see and do, we could only see a small selection of the offerings of the fair. And the offerings of the fair are great indeed, as there's no dearth of variety among the acts, which spans the gamut of everything from stage comedies to live glass blowing (a very educational act!). One act in particular that stood out to me was the comedy/juggling act of "The Jester of Muncaster Castle", Paolo Garbanzo, who engaged his audience in very authentic and enthusiastic ways that left a smile on everyone's faces. 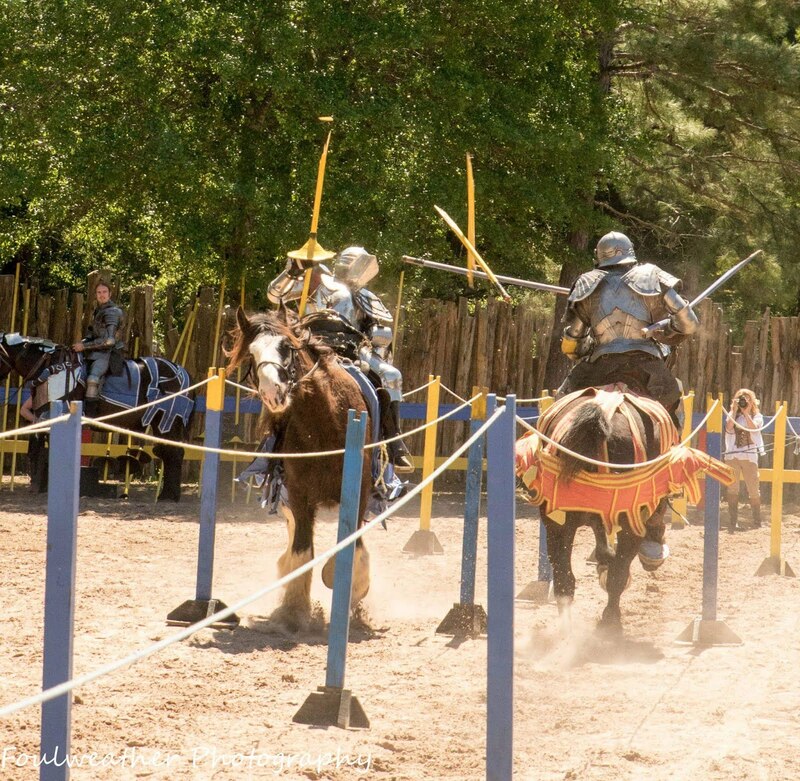 Around midday, we headed to the arena for the main event: a re-creation of a joust and melee. This is a truly incredible event that you're not likely to see anywhere else (or at least anywhere that's not a Renaissance fair!). Each section of the audience is assigned one of the Champions, and then encouraged to root for them. 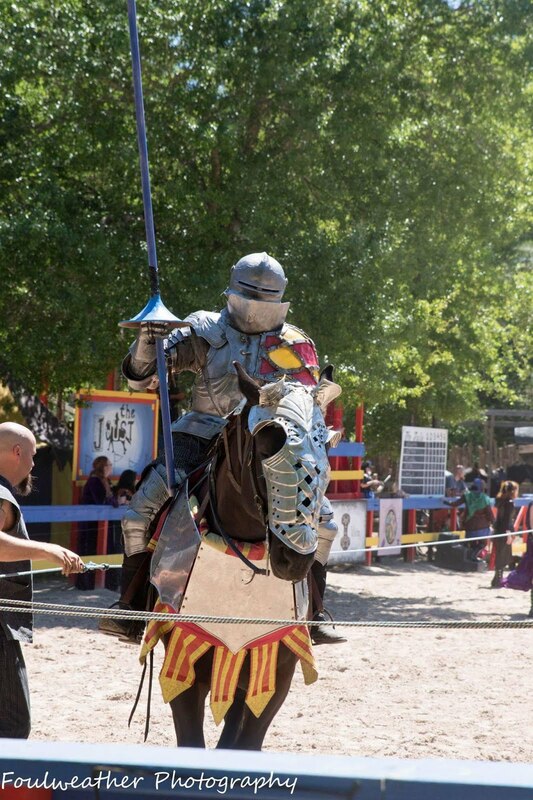 The joust is totally genuine, with no light contact or wrestling style theatricality. It's damn exciting to see the knights going at each other, not knowing if one of them is about to eat the dirt. The melee after the joust is staged, and played more for laughs, but one has to give props to the guys for getting up and doing a choreographed routine after getting knocked from their horses at a full gallop! At this point, we'd worked up a bit of an appetite from all the fervor at the arena, and we decided to grab a bite to eat. There was a little less variety among the food booths, most of them consisting of variations on roast chicken or turkey. Judging from the lines at them though, they must have been pretty good. There were a few outliers here and there though, such as a waffle stand, and a Mediterranean booth, which is where we ate. The food was quite good, but make sure you bring some cash because many of the stands don't accept cards. While we were eating, we took the opportunity to gaggle at some of the fair-goers and their often elaborate costumes. Despite being a renaissance themed event, the costumes encompass a large portion of history, from Ancient Roman Legionary to Early Modern French Musketeers. Neither is the dress exclusive to historical apparel but also spans modern subcultures such as fantasy and steampunk. Many even have costumes from popular properties such as Game of Thrones or Harry Potter. We felt a little bemused to be so casually dressed among these people who put so much work into their outfits. No need to worry about sticking out if you don't want to dress up though: the majority of people were wearing normal clothes. After eating, we perused the wares. Most of the stores are a bit on the pricey side, but that's to be expected considering that many of the merchants are selling handcrafted products that appeal to a niche market. Leathers, Horns, jewelry, weapons (both wooden and real), armor, other exotic goods were on display. Even if you don't intend to buy, the selection is so big, it's fun just going store to store to see what you could possibly find next. I settled a simple wooden mug, to add to my growing mug collection. In summary, the fair was terrific fun and would recommend everyone experience it at least once. It's a great, affordable (entry is 23.00 for adults, 19.00 for kids), and fun for everyone. Have you ever been to a Ren Fair and how much fun was it? Make sure to keep up to date on all our adventures by following us on Facebook. Jack needs to put up a picture of his Ren Fair costume!